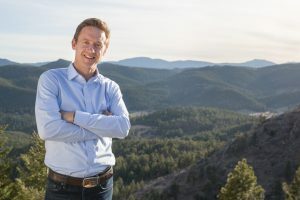 On June 22, I spoke with with Mike Johnston, a former US senator who is trying his hand to run the Governor’s office of Colorado. Johnston is currently seeking the Democratic nomination. The Primary Elections are scheduled for June 23 where Johnston will hope to discover himself as the Democratic nominee. The main platforms former senator Johnston is running on are keeping education affordable, protecting the environment, growing the economy, and more gun control. As a former principal and teacher, we began the interview discussing a familiar topic: education. “I think one of the keys to education is making sure every child can get an early start.” said Johnston about his plan for ensuring each child can attend free full-day Kindergarten. “We want to make sure we pay teachers what they deserve,” said Johnston. The potential Democratic candidate hopes to make Colorado a desirable place for teachers to work. If Johnston wins the nomination and goes onto win Governor, he promises to “repeal the worst parts of TABOR” and wants to see the economy recover after that. Johnston explained after the economy and state budget begin to recover, he will prioritize $100 million dollars to increase teacher pay. The former senator, would like to see Colorado become the first state be 100-percent completely renewable energy by they year 2040. Johnston has taken a hard stance on gun safety by creating the hashtag “#4NoMore” in hopes to spark the end to gun violence. With my closing question, I asked the candidate if he had any last messages to leave our listeners. To listen to our full interview, tune in to the re-airing at 90.5 KCSU on June 26 at 8 am or 12 pm.